With 31 years of creating, writing and storytelling as a hobby, Samuel thought it was time to fulfil a dream he only just acquired. In 2015, he quit his job as a chef of 17 years, due to several factors one being a full-time carer for his mother and the lack of creativity in his life. Over the last two years, he has accumulated many relationships in the writing world which have to lead him to become a mentor, public speaker, teacher, promoter of fellow authors and he also volunteers his time for various writing groups situated on the Gold Coast i.e. Gold Coast Novel Writers, Writers Activation and has just been re-elected as Social Media Manager for the Gold Coast Writers Association. Along with publishing a series of short reads - FableLand: Interrogation and his first major novel, Lake Merrin. Samuel continues the development of FableLands: Fugitive sequel to Interrogation, The Great Spoon Heist, companion novella to Lake Merrin and it's sequel Bloody Coin. Lone Solo is the name given to our brave adventurer when he first registered for the position. Unlike most of the recruits, who sign up for some sense of morality or a desire for adventure, Solo signed up for one reason and one reason only: money. Up to his eyeballs in debt to the crime lord who ruled the city of Lake Merrin, an intimidating man named Malik, Solo is desperate to make some quick coin so that he can pay off his debt and save his own life. However, Solo could never have imagined the true adventure that was waiting for him. Betrayal, attempted murder, successful murder, nefarious plots, and much more await the adventurer and his new team of gruff misfits known only as “The Rejects”. Will Solo and his new friends be able to unravel the mystery in time, or will the entire city crumble? Lake Merrin, the first novel in Samuel Colbran’s fantasy series, Journal of an Adventurer, is a fascinating story with an incredibly diverse cast of characters, including dwarves, elves, humans, and halflings of all races. The cast has incredibly different personalities, backgrounds, and goals to reach towards. The characters are also incredibly well developed throughout the book. The characters’ personal growth is amazingly, realistically gradual, and always clearly influenced by the circumstances that the characters find themselves in. The overall quality of the writing is pleasing. I would definitely recommend this book to anyone who loves a thrilling adventure and fascinating fantasy lands! 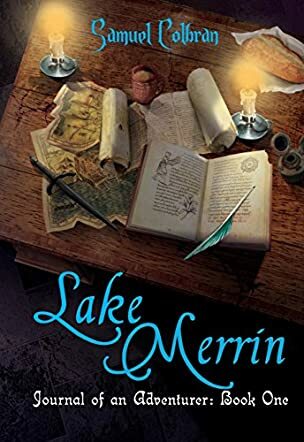 Lake Merrin is the first entry in the Journal of an Adventurer by Samuel Colbran, a great read for fans of adventure with a tinge of magic and fantasy, deftly written and filled with fun. He is a half-breed who goes by many nicknames — at one time he passes for “Lone Solo” — a man who, two years back, only cared about money, women, and grog, and who got embroiled in a conflict he never saw coming. Having survived Greywalker Reach, he is poised for the impending war — the war to end all wars — but what awaits him could be far worse than the monster Zlata. He’s witnessed friends dying, has lost the love of his life, but is he ready for what is coming and can he brace himself to be the hero the world needs? Written with beautifully crafted journal entries, this tale of adventure is unusually humorous and the author shows great creativity when it comes to language and the worldview of the protagonist. Readers are plunged into a strangely familiar world, where people buy things with copper bits and where strange beings exist. The language reflects the setting and it is interesting to follow the protagonist, a character who quickly moves from being a stranger in this world to becoming its hope. The characters are awesome and readers will enjoy Roth and Bruce, and Pela who, in spite of giving the protagonist a wonderful experience, threatens to cut off his manhood. Samuel Colbran’s use of the first person narrative is terrific and it has a charm of its own, compelling readers to stick with the protagonist throughout the story. Lake Merrin is a magical place where readers can easily find an escape from the doldrums of life. It’s masterly, engrossing, and delightful. Lake Merrin (Journal of an Adventurer, Book 1) is set in a time of Elves, Dwarfs, Gnomes, and humans living together. Each group has their degree of dignity, except if you are a Halfling or a mixed race individual. Samuel Colbran records this Adventurer's account of his actions and diligently conveys his thoughts, daydreams, and enormous ego. He takes on the name of Lone Solo when he signs up to work with the Watch. This name replaces the name he was given at birth, but most of the time he is called derogative names. He is a half Elf and half human orphan who entered the military to obtain his citizenship. When he is placed in Captain Stillwater's small unit, he helps to uncover a plot to bring his city to its knees. Throughout the novel, he insists he is just doing his job for money to pay off debts, but his hero's heart keeps shining through. Those who know him best - Stillwater, WayWocket, Gunnar, and Pela - see through his facade and support his crazy personality. As this is the first book in the Journal of an Adventurer, I am looking forward to Samuel Colbran delighting us with more of his escapades. At first I thought Lake Merrin was slow reading, but I realized quickly that there were important events unfolding and characters developing that the reader needed to be familiar with. Lone Solo comes across as antagonistic, but I absolutely loved how Samuel Colbran discloses what his daydreams are about, and his fascination with the names of the streets. This mysterious fantasy will at the least amuse you, or like me, cause you to laugh out loud over Lone Solo's simple perception of those around him. I’m not one to read fantasy. Lord Of The Rings is still waiting for me to finish it since... when did the first movie come out again? So when I received the ARC copy, I wasn’t sure if I’d last though it. Well! I finished it, making Lake Merrin my third fantasy book read. Imagine an Australian bush town, only bigger and no kangaroos, and change it to a medieval type of city and change its inhabitants into dwarves, elves, and other mixed versions of them. The magical spells of Dungeons & Dragons appear closer to high school chemistry mixed with the fun elements of a crazy scientist. And the people have all the same characteristics as modern society, only they don’t have social media. This book is not like the usual fantasy books that I have read in the past. Lake Merrin is filled with excitement and adventure. As I journeyed through the book, I felt like I was in medieval times, with a modern twist. The author's description had me walking the streets with the main character, and oh how I loved him. I always love a good guy who is well... not so good and Lone Solo is far from perfect, but is still a fun and enjoyable character. As he joins his band of 'Rejects', conspiracies and corruption start to unfold. I'm not the biggest fan of the journal narrative structure, but I admit to getting caught up in this story. While the finishing could have been a little better, the story itself is solid, engaging and sets the groundwork for what I can assume will be a series. The main character, the somewhat ironically named Lone Solo (not his real name), has just enough flaws to make him likeable, and his companions fall slightly to the left of typical archetypes which makes them interesting. They're not really loveable rogues, more like loveable idiots who manage to turn shambolic situations into heroic escapades. Push through the first few chapters and you'll find a well-paced story. There's a little bit of Pratchett and Rankin about it, and unlike the author's more recent short works, this is a full-length novel. I'll be reading the next book. This is completely different to the style of books I normally read. Surprisingly, I found it interesting. The author's characterization of Lone Solo, who 'lollops' through the tale bouncing from one near trauma to another. As for the world the author created, it was an interesting mixture of past, present (yes) and future. I read the author comments about how the book came to be - and understand the world and characters better. My son would love this... and I think it is worth the five stars I have assessed it as being. What a rollicking good read! Sam Colbran has created an interesting 'world' that blends medieval culture with modern concepts, and it works well. It took me a while to warm up but once I really got into the characters, I enjoyed their individual personalities. Lone's dialogue, interspersed with his witty self-talk, reminded me of a few real men I have met. Sam Colbran's mix of 'ethnicities' in Lake Merrin is a good vehicle for commenting on what it is to be different and unique. The characters are developed through some magic, mysticism, chemistry, morality, and ethical dilemmas. I read Lake Merrin in Kindle form so I missed out on maps - would have loved them. One suggestion - it would be helpful to either bring the glossary up to the front of the book, or perhaps alert the reader to its existence early in the book (although this may be present in the printed version). Well done Sam - you are developing a mature style that will have readers looking for more! The main character is a special sort... who doesn't take himself too seriously and yet at times shows startling clarity... The world itself is complete and richly thought out and having the main character not take even the town he is in seriously (Those street names... lol) this book is a fun and light hearted take on a genre that sometimes takes itself far too seriously... The writing style is unique unto itself and takes us into the mind of this interesting hero and allows us to 'experience' the world from his viewpoint, the characters that surround him are at times blunt, but you can't help but agree with some of the things they say. Not your typical hero at all... but there are hints of something so much greater... this adventure has only begun to start and i am eager to read on as the books progress... as we learn more and more about our 'hero' and the exploits they get up to. Unlike any fantasy I've read before but such a likeable accidental hero. I struggle with present tense and it's unusual in this genre however, plenty love reading in the present. Colbran weaves a masterful adventure with his first foray into a full length novel. Favinoian as a realm where steam-punk meets the Dark Ages. Lake Merrin is a tough town on the lake shore and no place for wimps. It's populated by all the usual suspects, dwarfs, elves, sort-of-humans and a few other species of dubious provenance. No one gets along that well and it's best to belong to a group such as a guild or a military association is known as adventurers. Even then nothing is guaranteed. Being a half-breed is a profound disadvantage around Lake Merrin. One such individual who dubbed himself Lone Solo needs to join a group — any group — because debt-collectors are hot on his heels with murderous intent. Lone Solo is quick on his feet and good in a fight, but with a mouth that says 'giddy-up' before he's hitched up his brain. Anyway I'm not going to give away the story, but there's enough double-dealing, treachery, danger, rough-and-tumble mayhem splashed across the pages to satisfy any fantasy fan. It took me a little while to get into this book mainly due to the "present tense" style of writing. But after the first few chapters, the story began to weave its magic around me and then I reached the point where I had to keep reading until I finished it. Thoroughly enjoyable with characters from a medieval background. If I have a criticism, it's that some of the intricacies between certain of the characters and their stories could have been embellished a little more to provide even further flesh to grasp hold of in this amazing place. Samuel Colbran's Lake Merrin was a pleasure to read. Lake Merrin immersed you in a world where the richness of Sam's imagination has really taken root. The story follows an adventurer as he tries to find a place in the world. It details his struggle to avoid debt collectors and find work. The world in Lake Merrin is remarkable, Sam has put a lot of thought into the world and has hinted at the details without info dumping the reader. I really hope that there is a way we can find out more of the details that he has placed into his world. The writing style was first person present tense, which is very different to what most people in the genre would normally write. This approach is refreshing and captivating at the same time. At some points it was a little tricky to understand who was talking, At several points the main character had insights that were a little bit of a stretch. Almost as if he knew what the other characters were thinking and feeling. These instances were few allowing the reader to enjoy the baulk of the book. The way everything worked itself out at the end was satisfying if a little convenient. I much prefer to be left wondering if something will get resolved, not everything in life has a satisfying conclusion, but that is more my writing style. If you like a well developed world where the bad guys get there just deserts and the hero saves the day and the city and makes lots of money, this story does just that. I look forward to more by Samuel Colbran. I really enjoyed this book great work. The great thing is that this book is titled as Journal of an Adventurer: Book one. I am waiting eagerly for the next one. "Sam, get writing. You have fans to please." The fortunate mishaps of a half-witted half-breed! Lake Merrin was a highly entertaining story and I continually found myself sniggering. It actually reminded me of Forest Gump, in that what Lone Solo (the hero) lacked in smarts he made up for in dumb luck! He was a brave soul and an accidental hero... The story is told through his eyes, and although it took me a chapter to adjust to this style, I soon found myself swallowed up by it, and I was compelled to read on to see what his next escapade would be. It was amazing really, I literally felt like there was a darkness in my peripherals and I literally was experiencing the world though Lone's eyes. The settings were awesome and described in just a few clever and colourful sentences. And the supporting characters were also colourful and some of them comical - I laughed when I read the squabbles had between he and his comrades, and I could almost here 3 Stooges type music playing in my head! Such a fun book! And I look forward to Lone's next adventure. Awesome to see a book of this genre not take itself too seriously. Tremendously enjoyed this fun read and several 'facepalms' at the main characters ability to fall in and out of situations to sort off become a slapstick accidental hero. There were times the theme soundtrack from the Benny Hill show played in my head while reading. Loved it. Favinoia as a realm where steam-punk meets the Dark Ages. Lake Merrin is a tough town on the lake shore and no place for wimps. It's populated by all the usual suspects, dwarfs, elves, sort-of-humans and a few other species of dubious provenance. No one gets along that well and it's best to belong to a group such as a guild or a military association known as adventurers. Even then nothing is guaranteed. In "Lake Merrin - Journal of an Adventurer Book 1", Author Samuel Colbran has created a wonderful fantasy world, populated it with a host of zany characters (especially the narrator protagonist Lone Solo) and produced a captivating and entertaining story. Much of the ribald humor was much to my taste (or lack thereof), and I got a kick out of Colbran's creative use of language. A terrific effort from a new writer.